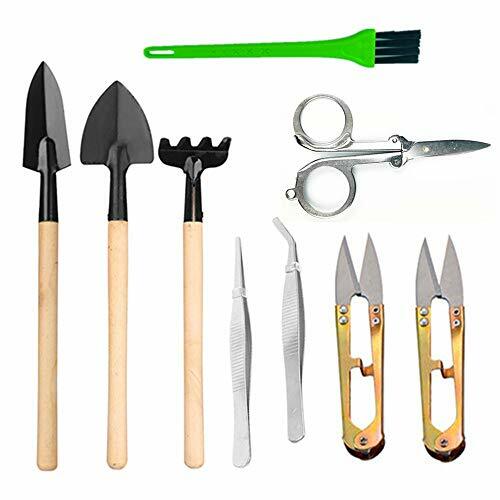 Garden tool set（succulent tools） is perfect for all your garden needs, such as digging, weeding, loosening soil, aerating & transplanting. PRUNING SHEAR to cut twigs, smaller branches, leaves or roots easily. SCISSORS to cut twigs, smaller branches, leaves or roots easily. TWEEZERS to remove dead leaves, insects, weeds and other fine debris. BAMBOO BRUSH to enhance your bonsai tree. RAKE to plane or rake the surface of the soil when repotting. LONG SPADE for repotting and helping get roots down in small areas of the pot. WIDE SPADE for repotting and helping get roots down in small areas of the pot.